Freshly back from Europe with a new job, Samantha Svensson (Sven) reconnects with her old friends while managing a new role within the Big Super Ministry - where everyone is busy playing their own internal political games. After the HR Director ends up dead on the same train that Sven was on, suspicions abound, not least from the chief investigating police officer, Charlie Rogers, who happens to be her ex and is still incredibly damned hot! With Wellington still reeling after a recent big earthquake, Sven must use all her canny resourcefulness to clear her name and identify the killer within their midst. 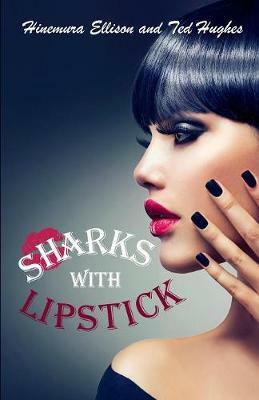 Sharks With Lipstick is set in the far away paradise of Aotearoa, New Zealand in the deep south of the Pacific Ocean. The story is set in the capital city, Wellington and reveals the drama and dilemma of twenty-first century business and life. In particular, the comical inefficiencies that lie trapped within the four walls of the newly created Government department, the Big Super Ministry. The main theme focuses on the demise of Cathryn Ann Tennyson. Cat, the self important and vicious HR Director, a character everyone loves to hate, who until her untimely death has been planning the huge redundancy announcement of all announcements, just weeks before Christmas. Samantha Ann Svensson, Sven, of Swedish and Maori extraction, a new employee is bought in on contract who discovers too much revealing information and may be taking on more than she has bargained for. It is Friday evening and everyone is heading home, Cat, Sven and others are on the luxurious, commuter train, looking forward to the weekend and are celebrating happily in high spirits. However, come Monday morning, Cat has been found dead (on the train). Wellington having just suffered a terrifying medium sized earthquake, has left its' residents, mainly public servants up in arms. The BS Minister is on tenterhooks, and Alex, the new Head of Science is busily calculating the next big earthquake, predicting it will hit Wellington soon perhaps later today! As the investigation of the untimely death of the HR Director proceeds, racing against the Capital News' deadlines and the predicted earthquake, the finger points at different people. The top boss, deputizes Sven to do an internal investigation, parallel to the official Police enquiry led by Detective Sergeant Rogers, Sven's ex, who she still has an unresolved emotional attachment to, in an effort to manage the media fallout and the Minister's unrealistic expectations. Will Sven discover the killer in their midst? Can Charlie and her resolve their past and reconnect? A satirical, romantic mystery that all will enjoy.